Be prepared! We Decepticons show up in your neighborhood, you want to be able to defend yourself. After all, you need a way to protect Charlie from those evil robots in disguise, so you'd better be wielding the best in Transformers technology. We all know that Bumblebee is a huge fan of his plasma blaster, so if you're looking to gear up like an Autobot, we suggest you start there. Of course, we can't just start you out with a REAL plasma blaster. They're dangerous and quite the liability. 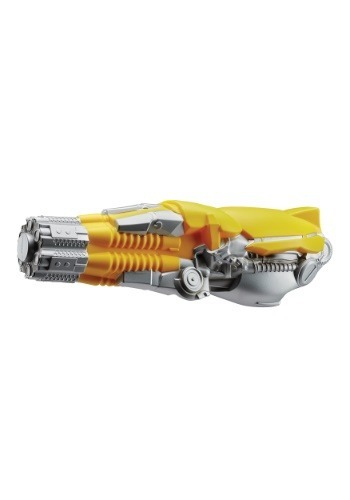 We can, however, help you start preparations by starting you out with this Bumblebee Movie Plasma Blaster accessory. It's the Bumblebee approved accessory for anyone trying to defend themselves against Decepticons! This officially licensed toy blaster looks like the one seen in the movie. It's made out of molded plastic and features silver and yellow details to make it look like a real Transformers blaster. It measures 16 inches long and puts the finishing touch on any Bumblebee costume. If you're trying to defend yourself from bots like Shatter or Dropkick, then you may want to make sure that you have this blaster on hand. If you're just looking for a way to create an authentic look from the 2018 Bumblebee movie, then this is also a great accessory for that!